This weekend, Art Series Hotel is set to launch ‘Art in Micro’, an exhibition of micro art – the next big thing in the art world. 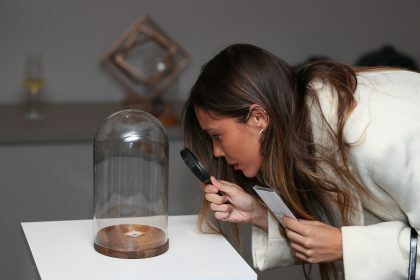 Starting this week, check-in guests will be handed a magnifying glass, along with a catalogue of the tiny artwork and prompted to find every micro art piece – some of which may prove to be all too tricky to see with just the naked eye. Guests who can find the art, and promote the exhibition, will be given the opportunity to win a trip for two to Le Louvre, Paris during their stay. Art Series Hotel’s marketing director, Ryan Tuckerman said: “We have a rich history of supporting and exploring contemporary art forms, and believe micro art will be of particular fascination this exhibition season. “Across the 8 of our Art Series Hotels, over 40 pieces of micro art have either been purchased directly from artists around the world or have been loaned. The exhibition features artwork such as; sculpted pencil leads by Salavat Fidai, the ceramic miniatures of Jon Almeda, micro dioramas of urban decay from Joshua Smith and micro watercolour on canvas by Varvara Razakova.